First cut a 5 1/2" x 8 1/2" piece of white card stock and fold it in half for the base and a 4" x 5 1/4" piece of white for the front layer. Next heat emboss the cherry blossoms on the front layer with a stamp from an Eastern Blooms set in Versamark ink with white embossing powder. Then sponge Stampin' Up! Positively Pink ink from left to right going from darker to lighter. Next stamp the sentiment in Positively Pink ink with a stamp from a Stampin' Up! All Natural set. 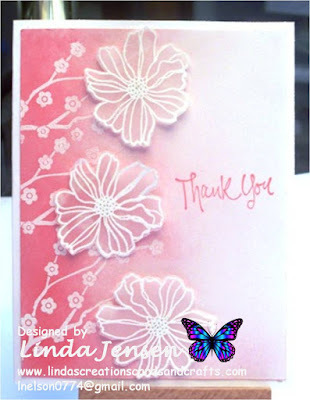 Then heat emboss the Fifth Avenue Floral flowers on vellum with Versamark ink and white embossing powder, cut them out, attach them to the front layer with mini pop dots, attach the front layer to the base and enjoy!